What started out as a small gathering with just 13 balloons in 1972, has grown to an international event that attracts almost 600 balloons and 1,000 pilots. And with this growth, the Albuquerque Balloon Fiesta (www.balloonfiesta.com) has also experienced some traffic problems. That said, you can bypass the delays this year and hop on a wheelchair-accessible Fiesta Express Park & Ride bus to get to and from the Fiesta Grounds. It’s fast, easy, and even economical. There are five Fiesta Express boarding locations, so there’s one that will work for just about everybody. Park in the northeast lot only. Park at the southwest corner near San Pedro Dr. and Uptown Blvd. Fiesta Express buses run from Thursday to Sunday during the morning and evening events. Morning service begins from the remote lots at 4:30 a.m. and ends at 7:00 a.m. Service from Balloon Fiesta Park to the remote lots begins at 8:00 a.m. and ends at noon, with straggler buses following until 12:30 p.m.
Evening service from the remote lots runs from 3:30 p.m. to 6:30 p.m., with return service from 7:00 p.m. to 9:30 p.m., and straggler buses following until 10:00 p.m.
Fiesta Bus tickets include transportation to and from the event as well as admission to the Albuquerque Balloon Fiesta. Advance purchase tickets are available on-line at www.balloonfiesta.com/guest-guide/park-ride. On-site ticket purchase is also available (except at Cliff’s). And for more information about access at the Albuquerque International Balloon Fiesta, visit emerginghorizons.com/up-up-and-away-at-the-albuquerque-balloon-fiesta. 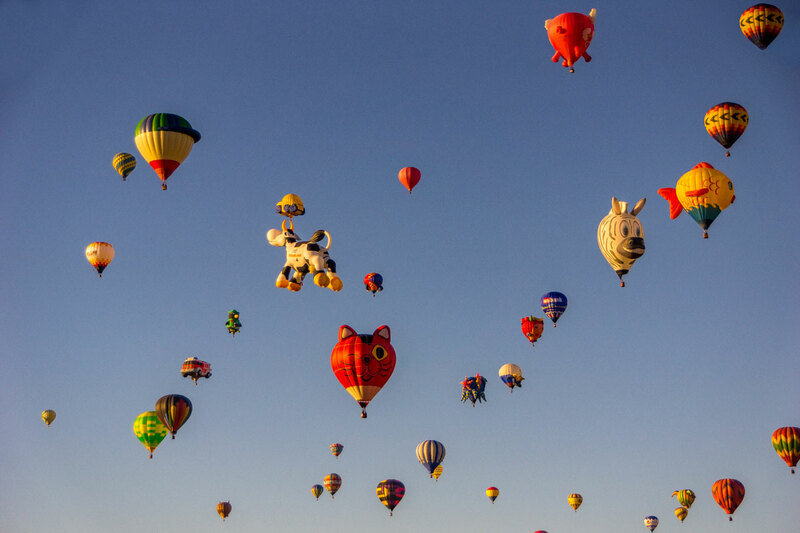 Ride the Fiesta Bus and enjoy more of the Albuquerque Balloon Fiesta this year!